Note: 3 compartments, 2 watertight bulkheads, double bottom water ballast tanks, hopper side tanks. 1897, May 7 Enrolled Port Huron, MI. 1901 Owned Pittsburg Steam Ship Co., Cleveland, OH. 1901, Sep 3 Aground Bois Blanc Island, Detroit River. 1915, Jul 9 Collision with steamer ROBERT FULTON, Lorain, OH; repaired. 1930 Owned Pittsburg Steam Ship Co., Cleveland. 1936 Owned Marine Iron & Shipbuilding Co. - Pigeon Lumber Co.
1937, May Renamed ALFRED; owned International Transportation Co.
1938, Apr Renamed ALFRED J.; owned Lakehead Transportation Co., Fort William, ONT; C170553. 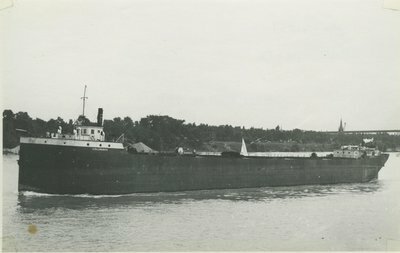 1943 Owned Great Lake Lumber & Shipping Co., Ltd.
1949 Owned Paterson Steamships Ltd., Fort William, ONT. 1951 Owned N.M. Paterson & Sons, Ltd., Fort William. 1960 Laid up Godrich, ONT prior to this year & used as a grain storage hulk; still there 1973. 1962 Owned Goderich Elevator & Transit Co., Ltd., Goderich, ONT.